It’s holiday time again! 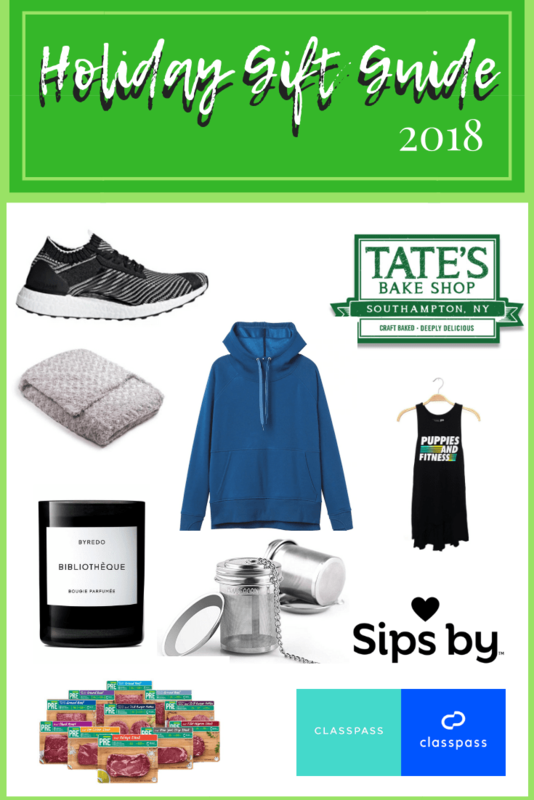 I’m only putting together one gift guide this year, but it has items that I love from each important category: food, fitness, and self care. None of the items in this guide are sponsored, but there are a few affiliate links which means that I will get a small percentage of the sale while the price remains the same for you regardless. I’ve also worked with brands as I can to get you discount codes because every little bit helps! Happy shopping! 1. Sips By: This tea subscription box made my list last year and it’s still going strong in 2018. Based on a simple survey you fill out when you sign up, Sips by sends you a curated monthly tea box with four different types of tea. The included card lists the brand and type, level of caffeine, a detailed description of taste, serving size, water temp, and even a discount code if you like it so much you want to buy more. Honestly, for someone who is so picky about my tea, they have gone above and beyond with impressing me and I highly recommend it to other tea lovers. Discount: Use the code FORERIN for 50% off your first box. 2. Tea Infusers: Going off the above gift, Neil actually got me this set of tea infusers last year for Christmas and I use them daily. I drink a lot of loose leaf tea, and although the Sips by box contains a package of sachets each month, these are less wasteful and cleanup is a breeze. Seriously a great gift idea. 3. PRE Foods Meat Subscription Box: Until I had PRE beef, I was never someone who was picky about where it came from. I’d just tell Neil to grab some from anywhere when I was in the mood for a steak or ground beef. After trying PRE and learning more about the brand (grass-fed AND finished), I will go out of my way to get them at the store. Even if you don’t care about the backstory of where the meat comes from, it honestly just tastes so much better than any other kind I’ve had before. You can individually pick your selections, choose from curated beef box options, or subscription boxes if you’re ready for repeat deliveries. Discount: Use the code ERINSINSIDEJOB for 10% off your order. 4. Tate’s Bake Shop Gift Box: You likely all know my love for Tate’s cookies, but I had no idea that they had gift boxes until they sent me one for the holidays. Upon further inspection, I discovered that they also make brownies, blondies, and a variety of mini loaf cakes! If you know anyone else who loves Tate’s or even if I’ve gotten you hooked on them as some have told me, you need to get these one way or another. Another cute idea I saw from King Arthur Flour is their Baking Box which comes with all the ingredients needed to make a recipe (I have my eyes on their pumpkin-pecan spoonable cakes). It’s a super great gift for anyone who likes to bake! 1. Byredo Candles: This scent is my absolute favorite candle and was one of the best presents I received last year. I’ve mentioned before my new found love for higher end candles simply because the scents are so unique and they’re generally higher quality in terms of burn time, etc. That doesn’t mean that I can afford to buy a ton of them, so I either ask for them as gifts or buy one or two a year. Byredo is a more expensive brand, but I still have more than half the candle from a year ago, so that’s pretty good. I also like Diptyque which are also pricey, but less than Byredo. 2. Magic Weighted Blanket: I’ve wanted a weighted blanked since forever and when I got one earlier this year, it was magical. I’ve been seeing them growing in popularity, so I feel better about wanting something the weight of a dentist’s x-ray vest on me. One suggestion I have is to go with the Lite version (14 lbs). I went hard with the 20 lbs, but unless it’s REALLY cold I’m not able to sleep entirely under it because I get too hot. You can also choose from a variety of outer materials from chenille to fleece. Discount: Use code HUGS10 for 10% off your entire order plus free shipping. 3. Puppies Make Me Happy merchandise: I own three different Puppies Make Me Happy shirts. As soon as I found the company, I began ordering because their stuff is so cute. All three shirts are great quality and I wear them all the time. Since I’ve last ordered it looks like they’ve added a ton more and they’re always coming out with new styles. Nothing says self care like puppy-themed clothing. 2. Athleta: Yes, I am an ambassador for Athleta, but I’m certainly not obligated to include them in this guide. I have loved everything that I’ve gotten there, including some of their non-workout items like sweaters and jeans (yes, jeans!). Their yoga and lounge clothing is SO SOFT it’s insane and there are so many things that I want from the store. If you haven’t given them a chance, seriously spend some time in one and you’ll see what I mean. Discount: If you’re a fitness professional, sign up for their Fit Pro program which gives you a 30% discount off your purchase each time. 3. Classpass: Classpass has gone through some serious changes since I first used it four years ago, but it seems to be holding on as a popular fitness choice for those who don’t want to commit to one studio. Classpass allows you to visit thousands of studios based on a credit system that you choose when making a monthly commitment. There are three tiers to choose from which offer you varying amounts of class credit. You’re also able to use it when you travel in any of their 50 cities. Here is a link about how to give Classpass as a gift. Wow I didn’t know Tates had gift sets! Kind of want to buy myself one haha! Omg. Excuse me while I order all the Puppies Make Me Happy merchandise! Right?? That’s what I did as soon as I learned about it!